We moved into this house a year ago and for the life of me I cannot figure out why I haven’t shown you the backpack station I threw put together in this house. It could be because it isn’t very exciting and there really isn’t much to it. It’s what I would call functional but most definitely not fabulous. Perhaps I waited thinking I would improve on it somehow. But the truth is I haven’t which means I probably won’t. But hey it keeps the backpacks off the floor and easy to round up and that is what is important first and foremost. So here it is. Simple, simple, simple. A couple of hooks with a whiteboard above it, which to be honest we don’t really use that often (as you can tell) but we had it from the old house so we just threw it up there. I’d still prefer it inside the house but we just don’t have the space in our current entryway. It’s right outside the garage door though so it works just fine. Look at my sweet little doggie at the top of the stairs. So cute! And here’s with the door closed. 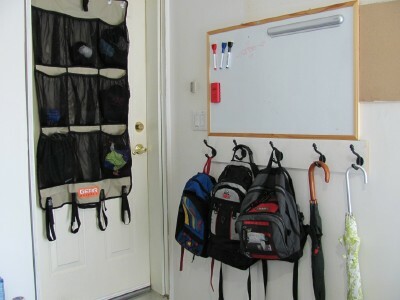 I showed you my Gear Pockets Organizer in this post and love it for corralling hats and mitts. 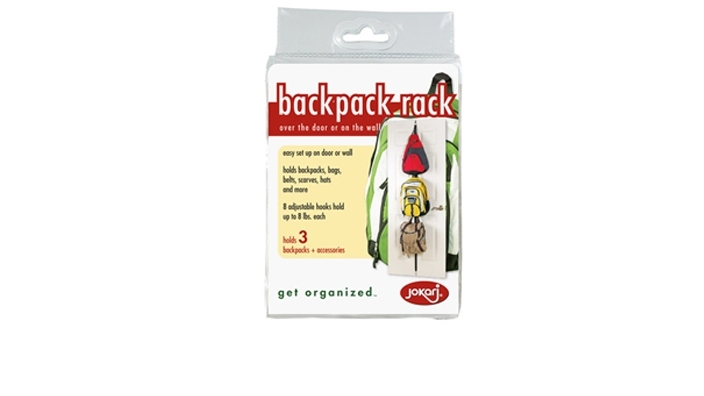 If you have even less space to create a backpack station, then you might be interested in this week’s Opensky deal which is a three piece hanging bundle pack which includes the space saving backpack station you see below for over an interior door in addition to one for your purses and caps. All for $18.00! I use the purse one in my laundry room and I love that I can still close the door with it hooked on. You’ll need to log in/sign up to see the offer. Do you ever struggle with your spaces if they are functional but maybe not so fabulous? 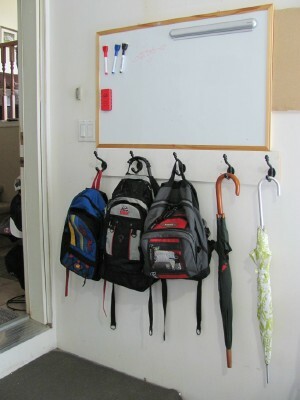 A quick coat of paint on the hook board and the whiteboard frame could make a big difference. Or even leave it white but have the kids draw all over it, add stickers and such. We recently moved. 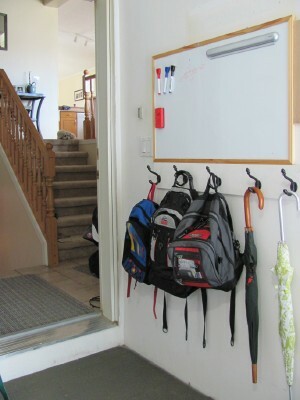 At our old place we were able to put a small hook rack in the entryway. We now have a bigger place and no where to hang it. So the boys came up with their own idea. Their backpacks hang on the backside of their chairs. Since they need it for homework anyway it’s working. The bags are not on the floor and the kids have to walk past them in the morning so easy to grab on the way out. Our system is almost identical, except it’s located inside beside the door to the garage. I wish I had a mudroom/space for cubbies… but I don’t., so this will have to do. We had a similar space when the kids were little. I gave up trying to buy something strong enough with enough hooks. Bought a piece of wood, stained it and hubby hung 8 strong coat hooks to it. It served it’s purpose well and now hangs there empty! Just hubby and I at home now, lol! Oh you are sweet Angie! I saw your backpack station and drooled…you seriously need to come help me pick paint colors for my house…I’ve been here a year and still all the walls are beige. Blah! I’ve been struggling with this for a while but now with my son starting kindergarten I feel the need to be the “organized mom” so I don’t lose track of all the stuff. 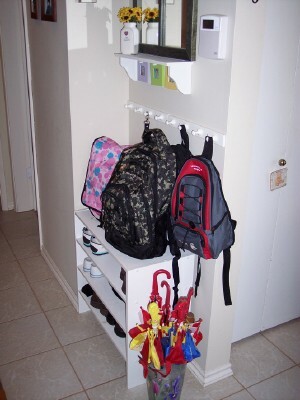 I have been thinking about putting something like this together, maybe some command hooks for his backpack, my purse, and maybe a jacket or two, and then a little bench with cubbies for shoes and stuff. I’d also go with a magnetic whiteboard I think, because like you I’d probably not use the whiteboard part often, but would stick stuff up there with magnets all the time. But, the only spot for this is right in our entryway, so I’m not sure how I feel about having that hit you in the face as you walk right into our “formal” living room. 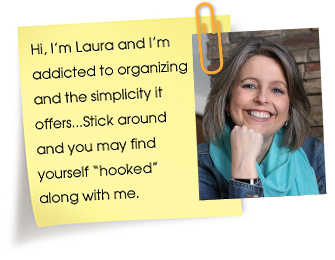 (I have to use the quotes because we’re so not formal people, but the room kind of is.) Thanks for giving me some renewed motivation to tackle this little project! I need to do this. Backpacks everywhere are driving me nuts! We have hooks right by the door, but they’re too high for Liliana. I’m thinking in the new house (we might buy one), I’ll have to hang my own lower hooks.